No one has ever crossed New York City's Verrazano-Narrows Bridge on a unicycle. Then again, no one has ever had to -- until now. Unicycle enthusiasts Keith Nelson and Rob Hickman are on a mission to cross every bridge in New York City -- all 2,078 of them -- on one wheel. Next up is the Verrazano, which connects Brooklyn to Staten Island and at 13,700 feet happens to be the longest suspension bridge in America. 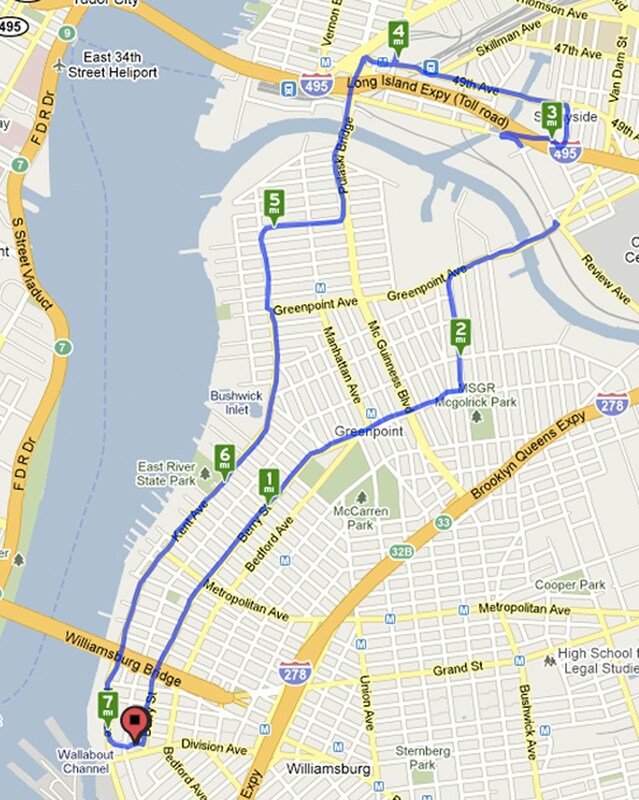 Sunday's 42-mile Five Boro Bike Tour is the only day the bridge is legally open to cyclists. Nelson, co-founder of the Bindlestiff Family Cirkus, and Hickman, a New York City artist, were welcomed by the tour's registration committee and received favorable starting positions ahead of the pack. "I'm confident that these zany unicyclists will generate many smiles and much laughter from their two-wheeled counterparts," said Kenneth J. Podziba, president and CEO of Bike New York. "It'll be like the circus is riding through town!" The Verrazano will be their 100th bridge crossed, and quite likely the most difficult: Some 32,000 bicyclists will be heading over the bridge with them. "The two-wheelers don't anticipate the movements of a one-wheel cycle very well," Nelson told AOL News. "We regulate speeds different than a bike can. We can't coast, we don't have gears, we have different issues on hills. I'm just hoping they give us the room that we need. If we fall, you may see a 20-bike pileup." Of course, this is no competition, so there's no hurry. "I expect it to take forever, and I will make as many stops as I can!" said Hickman, who's already done the tour on two wheels several times. They've been training with 15- to 20-mile rides to get used to the distance they'll need to cover. 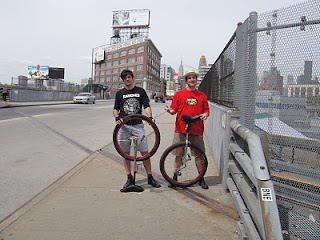 The unicyclists began their bridge tour in October with a ride across the 7,308-foot Williamsburg Bridge, which connects the Lower East Side of Manhattan to the Williamsburg section of Brooklyn. "We started this whole thing on a whim," Hickman said. "Originally the goal was just to cross the Williamsburg Bridge." But after going across and back, the duo still had energy left in their legs and kept going. At that point they decided to conquer all the bridges, thinking there would only be 70 or 80. A quick Google search later revealed a couple thousand more, which includes overpasses. "The notion is clearly absurd, but I can rationalize it in many ways," Hickman said. "I've always had collections -- coins, stamps, beer cans. 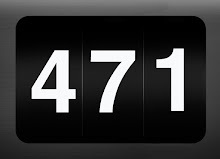 If you think about it, a collection of 2,078 isn't too daunting." Naturally, they turn more than a few heads with every ride. Other than being asked if they juggle (they don't -- at least, not while riding) the reaction has been overwhelmingly positive. "We get everything from, 'Awesome!' to 'Thanks, you've made my day!'" Nelson said. They get the occasional haters, too. "We get a little flack from spandex-clad bicyclists calling us freaks, but they should just look at themselves in the mirror." Both Nelson and Hickman have only been riding for a little over a year. Other unicyclists have joined them on the first 99 bridges, and at least two or three others are expected to join them in crossing the Verrazano. 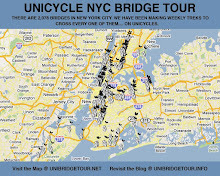 Their complete tour can be followed at their Unicycle NYC Bridge Tour blog. With Keith successfully convincing customs officials to let him back over the border from our friendly neighbor up the north, Rob & Keith decided to celebrate by going for a unicycle ride. Once again the departure was delayed by an enlightening conversation with one of the construction workers on the block. The discussion brought to light some interesting twisted dealings of NYC's landlords. Following gaining knowledge of an alleged building inspector bribing scheme which had occured yesterday, we decided to do our own inpection by checking the the Borden Avenue bridge progress, which was closed on our last trip to the Newton creek. With no prior planning, the pair left South 11th Street and headed for the Borden Avenue Bridge via the Greenpoint Bridge..
Keith was quite tired and slightly delirious from less than an hour of sleep and thousands of miles of travel. Celebrating World Circus Day (April 17) Keith had gone to New Brunswick Canada with the Bindletiff Family Cirkus to perform for an audience of 4000. Ketih had started this morning in Shediac, New Brunswick, Canada, landed in Newark and trained it to Brooklyn. by 10 am. Rob was sore from late night ladder yoga in preparation for a sheet rocking festival in his home. As temperatures were climbing from the mid fifites. Keith enjoyed the warmth compared to the lower 40's of Novia Scotia. Rob felt a chill compared to the Central Park rides. Both riders wore two layers on top and exposed legs on the bottom. Because of the cool weather Rob intentionally headed off without a water bottle, which he soon regreted He also forgot tools and a patch kit. Keith had a cyclemeter running and the rubber chicken dangling below the seat, otherwise, he was not prepared to go some distance, but the ride was going to be under 10 miles. Keith continues to forget to look into hydration systems for the upcoming ride. With less than ten days until the 5 borough cycle tour, starting passes in hand and, sponsor filled green vests, it is time to always pedal the rigs packed for the forty miles. As we thought about how our desire to cross the Verazano Bridge lead to the sixty dollars paid to then become a rolling bill board, the need to promote our causes became apparent. We need to use the 5 borough to get the word out about the Bridge Tour and the coming Unicycle Festival. [sponsors, feel free to contact Keith or Rob to discuss sponsorship and ad placement possibilities]. Bad road conditions and major road construction were a significant factor during the journey through northwestern Brooklyn. As Williamsburgh gets its gentrified face lift and the push to build up, the streets and sidewalks are being opened up to rewire and plumb the neighborhood for the new demands. And so the ride included lots of constriction work. Rode conditions in north Brooklyn were as bad as Richmond Terrace in Staten island. Although pedaling this region included lots of zigs and zags routes that forced us into truck lanes, we were greeted by almost giddy street workers. We experience a number of workers giving us hoots and hollers on Berry. The steam roller operator apparently was a closeted member of the one wheeled fraternity. From his seat towering over us he asked if he had a 20 incher. As the rides continue to show, the people love the one wheel. And so many have ridden. Aproaching Greenpoint Avenue Bridge the pair went for the much more rugged sidewalk. Last time they were on 26" wheels. This time 29". Once over the bridge, the tour took a left and headed towards Borden Ave. When we got there there was less bridge that the last visit. Much less bridge in fact. Rob mistakenly thought the bridge was due to be completed April 2010. Certainly Rob got the completion year wrong. It's probably more Like 2016. Disappointed, the pair departed in search of other crossings. With nearly 5% of the Bridges of NYC now crossed on one wheel, and the realization in Central Park that many of these bridges do not cross water, it has dawned on the riders that the 2078 spans of New York is a wider scope than previously understood. The count includes overpasses! With this in mind, looking back there have been many undocumented crossing that will need to be recrossed and photographed. And with the new knowledge we excitedly came upon an unexpected sight, the Skillman Avenue LIRR Overpass, spanning the Long Island Railroad Hunter's Point Station. And with little fanfare, we crossed the 98th documented bridge of the tour. Within a few blocks we came upon another span. And excitedly we pedaled over 99. On the other side of the 21st Street LIRR Overpass we met a friendly guy who had a history on one wheel in the Bronx. He reminisced of his past one wheel accomplishments: jump roping and riding a giraffe. He had gone from unicycles to being a cycle messenger (we assume on two wheels). He had ridden in the 5 borough cycle tour in years past, though years had passed since he had last relied on the power of the pedal. Continuing a life of rolling and delivering, he had gone to a life on 4 wheels and now drove and delivered for UPS. He was the first person to not be surprised by the fact that there are over 2000 bridges in NYC. It was time to head back to Williamsburgh so Keith could prepare to go work for Cirque du Monde in the Bronx. And so routing sent them from Queens back to Brooklyn over the Pulaski Bridge. Mid span Keith was recognized as a Bindlestiff Family Cirkus person by a passing bicyclist. Back in Brooklyn, the wheels were aimed for the protected cycle path down Kent Ave. With the exception of a prejudicial two wheel cyclist stating that the path was only for BIcyclists, the Kent Ave ride was a delightful and smooth ride. And to imagine, less than 10 years ago Kent was filled with pot holes, two way traffic, rumbling trucks, burnt out cars and hookers. It was now a construction zone promising to block the view sheds of thousands and provide a safe and secure environment for the wealthy. Following last weeks epic multiple bridge crossing tour of Central Park, we had assumed we would not be pedaling through Central Park until the 5 Borough Cycle Tour on May 2. During the week, however, Rob discovered a picture of a Wooden Bridge in Central Park that did not match any of our collected spans. And so the park maps came back out, satellite images were scrutinized, and a return to the park was planned. On the morning of the ride, Keith went to Rob's to discuss spoke and tire issues. Their discussion was redirected by Charlie, a carpenter for the Landlords of South 11th Street. Charlie gave a far reaching perspective on the neighborhood build. Charlie provided insider info on the Rose plaza demonstration. He mentioned that good money can be made through protest. Paid "demonstrators" are sent by landlords and developers to protest the rights of continued expansion. On facebook, Baruch Herzfeld expressed that the protest's stated purpose was to stop the "artisten from defiling williamsburg" but actually was a protest by proxy against one large real estate developer who supports the wrong rebbe". The pre-ride conversation made of a bit of a late start. And the rush was on to get to Columbus Circle to meet John Wyffels. Our tardy arrival was compounded by the L train being stuck in a tunnel. As we entered Columbus Circle we were excited to find a multitude of Unicycles for rent guys. And by the fountain we met up with John and took note of pre ride preparations. With the sudden rise in temperature, the previous week had brought up new challenges. We had gotten a taste of dehydration, sun exposure, over heating and chaffing the week before. And so changes had become apparent. John's 36" ride was now equipped with the Car Coffin, a new two water bottle racks. He also remembered sun screen, which despite their blistering burns last week, Keith and Rob forgot. Rob rode with a chilly April ride in mind, dressed in cold wool button down. Keith and John were more optimistic for a heat wave wearing only t shirts. Striving to remain in the good graces of the two wheelers riding the cycle loop, we pedaled from Columbus Circle counter clockwise up to 110th st.
At Lasker Rink where we entered the Ravine. Using Slammin' Andy's tattered map. a compass, and a GPS we headed up stream through the narrow gorge, scaling rock faces and whacking the dense vegetation. We had to portage over territory Kris Holm would have easily been able to ride. John impressed us by jumping over the 20' deep gorge. In the ravine we found three bridges and the remains of a fourth. Off the park drive just south of the Huddlestone Arch (that we crossed last week) we found a small stone slab bridge - spanning the Loch, which flows from the Pool at 101st St. to Harlem meer. We did not find the bridge whose image had started the trek back to Central Park. Wood Bridge #2 remains a mystery. According to public record, this very short wood bridge crosses the rivulet just west of Glen Span and just east of The Pool. Unlike other Central Park wood bridges, it doesn't feature contorted, distressed branches: instead, it has been ingeniously fashioned from old wooden parkway lampposts. Apparently vandals burn wooden bridges and they need to be replaced. Maybe the remains and footings we found were from this one. We also found what looked to be a bridge, but was actually a mouth of a spring. We documented it, but for the moment, aren't calling it a bridge. In the middle of the wild, we met a bird watcher. We explained our mission, and she directed us to the rustic bridge spanning the southern part of the pool. This low country style bridge was a challenging treat for the tour. From an original Central Park list of 31 bridges, we managed to find 48 total. 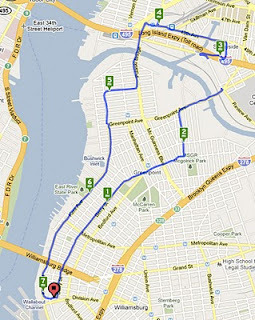 Once again, we are blazing the NYC Bridge trail. Soon to be your one stop location for Bridge facts, in every region we are already finding & listing more bridges than any other source. Each institution may know their bridges (MTA, DOT, Parks, etc. ), but none keep track of the others. We expect to soon become the official resource for the all the New York City Bridges. Along the way we saw peoples days change before our eyes. A disarmed park employee happily noticed "oh yeah, a couple of clowns." We got our second "jazzy" of the tour. And many a kid skipping school screamed "Awesome." 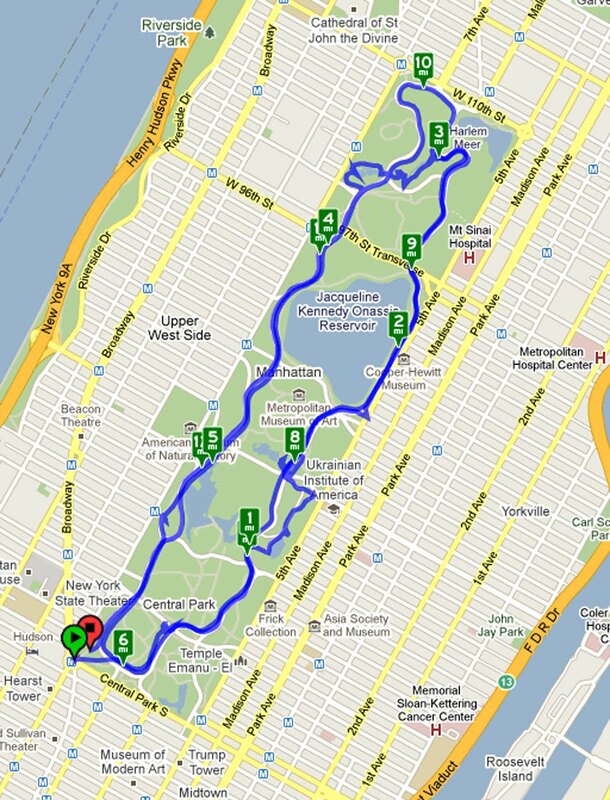 After one loop around the park, and the 5 borough cycle tour looming, we decided to do another. The Bridges had been documented for the day, although Central Park allowed for other documented locations beyond the spans. Keith treated us to the merry go round. They even let us ride with our unis in the horse drawn chariot. There was something fitting about rolling up to Alice in Wonderland on one wheel. Rob's first action was to circle the sculpture as young children jumped to the safety of Alice. A quick sit on a mushroom, a moment with the Mad hatter and a tip of the hat to Alice, it was time to ride towards a more somber moment. We visited the King Wladyslaw Jagiello Monument to pay hommage to slain Polish president Lech Kaczynski and show our solidarity with the people of Poland. Afterwards we pedaled hard for the last few miles back to Columbus Circle. Somewhere in the decent to the subway, we lost John. However mono wheel moments continued on the ride home. A 62 year old former King Charles Troupe member from the Bronx got on the L train at Union Square. He loudly pronounce that "In the 70's every kid in the Bronx had one of these". Rob let him try his out. The saddle stem was too tall so he mounted Keith's uni on the busy train. And so he idled and rolled on one wheel as the train crossed under the East river, thus marking the tour's first official tunnel span. At Bedford Avenue, he burst into song with his partner, as Rob & Keith departed. We arranged to meet at Columbus Circle at 11. With minutes to spare, as is custom, Keith ran to the deli and grabbed and egg sandwich and coffee. The park was swarming with people, due in part to the unusually warm early April weather NYC was experiencing. The park was filled with baby carriages, dog walkers, foreign tourists, senior citizens, cyclists, runners, roller bladers, sunbathers, leisurely class folks, and youngsters unable to cope with the first day back to school after spring break. The day was expected to reach into the high 80's. Riders showed up in shorts, t-shirts, and sunglasses. Gone were winter's heavy gloves and ski masks. That being said, none of the riders thought to remember sun cream, which resulted in some blistery burns the following day. Rob had learned from his shortcomings the week before, and was armed this trip with an air pump and patch kit. He was also breaking in a new water bottle rack rig, that he had co-designed up in Hudson with Jim Owen. The water bottle proved too small. Under the day's hot sun, Central Park's many pools, lakes, and streams would become tempting. The smallest wheels on today's ride were 26 inches. The majority were riding on 29 inches. John Wyffels rode a gargantuan 36 inch wheel. Sometimes size does matter. The three regular riders, Keith, Rob, and Kyle were joined by second time rider John Wyffels and first timers Andrew "Slamminin'" Peterson and John "Crash" Jessmon. Slammin' and Crash were able to join us to help create an unofficial launch for the 2010 NYC Juggle This Festival. 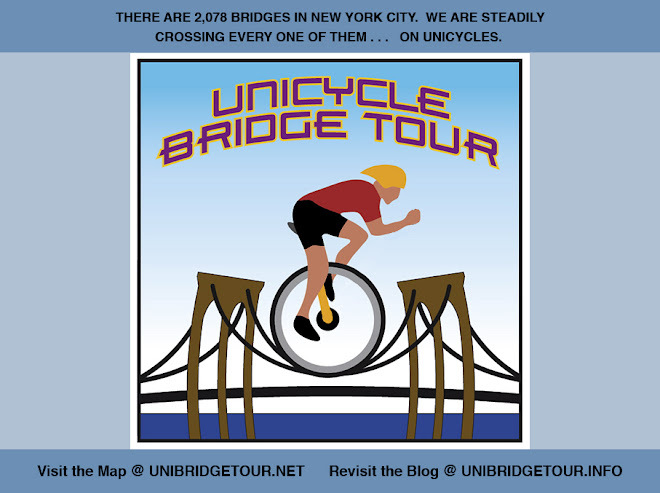 For the Unicycle NYC Bridge Tour it was a day of firsts and record breaking moments. We spanned an epic number of bridge and arches today, with a grand total of 44, almost equaling the number or bridges crossed over the previous 6 months. It was also the largest pedaling crew to date. A half dozen one wheelers road into the park at 11 am. It was the first time a 36" wheel rolled in the ranks. John's ride was also equipped with brakes and handlebars, something that many bystanders observed and commented on. Within moments of the start the two wheeled cyclists showed signs of annoyance at having to share the road with the mono wheels. It took a few moments for the regular riders of the tour to become accustomed to the chaotic patterns that bicyclists, roller bladers, runners, and darting dogs on invisible leashes take when in motion. At least one passer by made note of the fact that he had seen us in the NY Post on Monday. Discussions amongst the riders delved into the past couple of days' media coverage: NY Post, Gothamist, Village Voice, etc. Reacting to others opinions on line and in print media, certain riders voiced their like and dislikes for Yes and ELP Kyle asked who? Keith reminded us that ELP had done 'Brain Salad Surgery'. Unlike journeys of the past, the 44 bridge day forced a level of focus and dedicated documentation that had never been undertaken in the name of one wheel. The ride was overwrought with destinations. Past rides had 1 or perhaps 3 bridges as the day's tally. Prospect Park clocked in with the then record breaking 13. And thus the somewhat intact short term memory of visuals and detail sufficed. We expected 31 bridges, making maps and checklists essential. We discovered an additional 13 bridges and traverses that had received little attention or were completely overlooked in our preparation source materials. The first warm weather ride of the season brought to light the need for better hydration systems for the upcoming 5 borough bike tour. The main valve for the Central Park drinking fountain system hadn't yet been opened. Luckily Central Park is adorned with rolling carts providing all of the essentials for sustenance: gatorade, hot dogs, pretzels, ice cream and water. We appreciated the fact that even the food carts in central park are required to list the calorie count of every item. No remorse was felt in the calorie counts devoured. Keith and Rob had the lists of bridges with photographs, descriptions, and locations on their iPhones. First time rider Slammin' Andy arrived with 5 pages of maps and diagrams. And through a bastardized version of consensus a general route was planned. 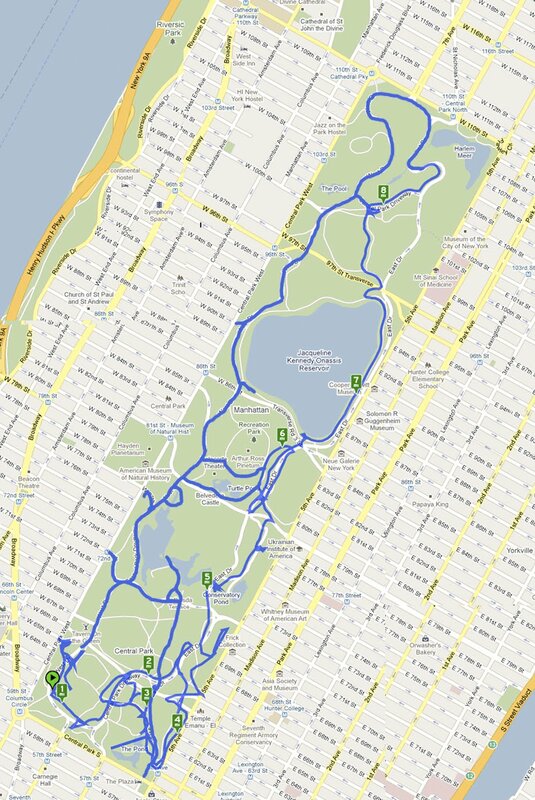 We agreed to travel in a counter-clockwise direction around the park drives to appease the two-wheeled spandex types. From the main drive we would take smaller circuits into the many fabled regions of the park to cross it's many bridges and arches. Most of the sites are located in the bottom half of the park. Central Park is littered with "Don't Bycycle" signs, but we saw no anti mono cycle signs anywhere on the journey. The group comfortably pedaled the small narrow paths alongside park rangers in their SUVs, comfortable knowing that if we were ticketed (which we weren't), we would surely get out of having to pay the fine. The question remained though, why do park rangers drive cars on narrow park paths and lanes, and why do police vans and parks employee vehicles speed around the main park drives, which during the course of our tour was devoid of other automobile traffic? We pedaled through the zoo, teaming with school children. Rob wondered if the small arch in the sea lion exhibit constituted as official New York City bridge, and if it did- how would we ever get permission to cross it? We rode by the carousel. Fortunately Daryll Johns wasn't with us or he would have gotten us into trouble. We rode through Strawberry Fields where musicians were strumming YES and ELP songs. We rolled by the Alice lost in Wonderland sculpture, where Rob had promised to meet his friend Roy 5 hours earlier. We rode by Tavern on the Green, because we couldn't afford to stop and go in for a beer. And we rode by Bethesda Fountain and barely resisted jumping into it's cool water. We stopped only to document the spans. It was a long and grueling day. As we finished the last bridge on the North side of the park, having just completed the 8th mile of the ride, we lost the capacity to chart the ride. 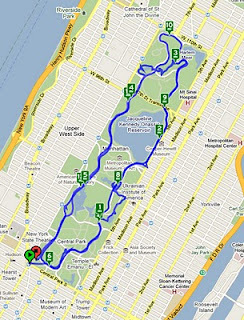 Let it be noted that although the Cyclemeter application for iPhone has been quite beneficial to providing statistics and maps of each ride, the Central Park ride was a reminder that Apple's iPhone is unable to provide the battery life for a single day of work, much less a 6 hour unicycle ride. As we came to the final dozen bridges, we started losing riders. With around 10 miles covered so far, all but the three most constant bridge tour riders headed to the subway. A few bridges later Kyle opted to return home to feed and care for his canine companion, leaving only Keith and Rob to finish the spans of Central Park. The last two standing rolled into the Subway Inn, one of the east side's only remaining dive bars. That being said, the $5 pints weren't affordable by Brighton Beach or Bayonne standards. Forty four bridges and arches crossed, bringing our total to 93. Afterwards it was unfortunately realized that we had missed a very short wooden bridge up in the northwest corner of the park just west of Glen Span and just east of The Pool. A return expedition is being planned. Calvert Vaux was, according to legend, inspired by the Orangerie at the Palace of Versailles in Paris because the designs of both spaces are similar. Hidden under the arches are colorful tiles on the ceiling made by the Minton Company of Stoke-on-Trent, England. Many of them have been removed for restoration. By the 1970s, Bethesda Terrace was severely deteriorated but careful work is gradually restoring it to its old glory. Though Versailles may have been its inspiration, the real genius of the Terrace Bridge lies in its detail work, executed by Jacob Wrey Mould. A flamboyant personage, he was disliked by many of his contemporaries, but he brought a whimsical personality to much of his work. Nowhere is this whimsicality more in evidence in Central Park than in the stone carvings that line the grand staircases that descend to the fountain. Bow Bridge was one of the seven original cast iron bridges built in Central Park during the years 1859-1875. Two of the originals were destroyed when Robert Moses became Parks Commissioner: Spur Rock Arch and Outset Arch, which took Center Drive over the bridle path, fell victim to auto traffic priorities (which, as we know, always takes priority in NYC). Bow Bridge, having fallen into disrepair, was renovated in 1974 and again in 1998. You can't see them, but cannonballs are set in the base of the north end of the bridge to allow expansion during temperature changes. The railing features Gothic cinquefoils and interlaced spiral designs. Large vases originally decorated the balustrades. Location: spans the Lake northeast of Bethesda Terrace. Built: 1859 -1862 by Vaux and Mould, with ironwork by Janes, Kirtland & Co. (which also did the ironwork for Washington's Capitol Building). Made of cast iron. Riftstone is one of the least-seen arches in the park. Most pedestrian and auto traffic cross it on 72nd Street on their way into the park. The bridle path beneath it is relatively bereft of equines. There's not many riders on it, so not many know about it. One of Central Park's "natural" arches. Calvert Vaux' aim was to build a natural-setting bridge instead of one using brick and mortar. The bridge has brick supports, but these are concealed by boulders, shrubs and trees. Gill Bridge is the first in a series of small wooden bridges placed over small streams in Central Park. It is known as Gill Bridge because it crosses the Gill, a stream trailing from The Lake. It has been destroyed by vandals a good many times through the years, but the Central Park Conservancy keeps rebuilding it. It is made of natural timber and has been given back its original contorted branches. Though it is over 110 years old, Eaglevale Bridge is actually one of the newer arches in Central Park. It carries the 77th Street access road over the bridle path and what was once Ladies' Pond (reserved for ladies-only ice skating in the 1890s. Robert Moses filled it in in 1936 and replaced it with a playground. Even today, the water, which lurks underground, floods the area after a heavy rain. Location: takes 77th Street over bridle path to West Drive at Naturalists' Gate. Built: 1890. Made of gneiss. Balcony Bridge is named for its two bays, or balconies, that feature seating for weary park walkers on hot days. Balcony Bridge provides one of Central Park's most scenic views over The Lake toward Central Park South and 5th Avenue to the east. The presence of balconies on the east but not west sides makes Balcony Bridge asymmetrical, a distinction shared by only Trefoil Arch. Ramble Arch has the distinction of being the narrowest of Central Park's arches, with its opening measuring only 5 feet across. One of the simpler, unadorned bridges in Central Park, Bank Rock Bridge used to be rather fancier. Originally known as Oak Bridge, it had cast iron balustrades and yellow pine floorboards. It was rebuilt along utilitarian lines in 1982. Location: takes West Drive over bridle path at about 82nd Street. Built: 1860-1861 by Vaux. Made of Maine granite and sandstone with cast iron railings. Southwest Reservoir Bridge is so named because it sits on the southwest edge of the Reservoir, this cast iron bridge was taken apart and reconstructed in 1979 according to Vaux' original specifications. The triangular space at each side of an arch is known as a spandrel. SW Reservoir Bridge's spandrels boast intricate floral motifs. Location: takes park path over bridle path just east of West Drive near The Reservoir at approximately 86th Street. Built: 1864 by Calvert Vaux and the Cornell Ironworks. Made of cast iron and steel. One of the hardest Arches in Central Park to spot, especially in spring and summer, Claremont Arch is relatively new, having been built almost 30 years after the opening of the Park. This part of Manhattan was not built up until the 1880s. It is named for the nearby Claremont Riding Academy on West 89th Street. Equestrians often ride on top of this arch in order to access the bridle path, which runs along West Drive here. As of mid-2001 the pedestrian path under the arch was inaccessible. Location: takes service road at 90th Street over park path at Central Park West. Built: 1890 ; designer unknown. Made of Manhattan schist. Gothic Bridge is the third of the great Central Park cast iron bridges around the Reservoir. In the first decades of the Park, before auto traffic, there was a great deal more recreational equestrian traffic in the park, and so the builders endowed the bridle paths with quite a number of arches and bridges that would enable pedestrians to pass over them. The triangular spaces at each end of Gothic Bridge (called spandrels) were given curved ironwork suggestive of Gothic church architecture of the Middle Ages, hence the bridge's name. The graceful curves and oval vault make Gothic one of the most distinctive bridges in the park and one of the first that photo editors turn to when they require an evocative Central Park scene. Location: take park path over bridle path north of The Reservoir, south of the tennis courts and South Meadow at approximately 94th Street. Built: 1864 by Vaux and the Cornell Ironworks. Made of cast iron and steel. Glen Span is the bridge to another world. Through this portal lies the Ravine and The Loch, the most secluded area of Central Park. Here the traffic noise falls away and the only sounds are the splash of the stream known as Montayne's Rivulet, which runs from the Pool to Harlem Meer to the northeast, the chirping birds and the bullfrogs. Remember that it's an entirely artificial construct. The Pool and Harlem Meer spring from the genius of Olmsted and Vaux. Location: take park path under West Drive, east of The Pool and west of The Loch, at about 102nd Street. Built: 1865 by Vaux. Made of gneiss and ashlar. Proceeding under Glen Span, the park path leads to a crosstimbered wooden bridge that crosses Montayne's Rivulet where it descends into a waterfall over boulders. Like its sisters, Eaglevale and Claremont, Mountcliff Arch was built to accommodate increasing population on the upper east side that wanted access to the park interior. This is the hilliest section of Central Park. Mountcliff is the park's highest arch at 48 feet. Location: takes park path under East Drive as it intersects Central Park West and 110th Street. Built: 1890. Made of gneiss and ashlar. To many observers, Huddlestone is the most remarkable Arch in the park. From some angles, it resembles a natural cave. It rests on neither mortar nor metal supports and is made of immense natural boulders, some of which weigh up to 20 tons. It has withstood traffic from horses, buggies, and unicycles on up to the SUV era. Huddlestone is marred only by the overshadowing Lasker Rink, built in the 1950s despite protests by park conservationists. Location: takes park path under East Drive near the Lasker Rink at about 107th Street. Built: 1866 by Vaux and Jacob Wrey Mould. Made of native schist boulders and held together by gravity and friction. Buried deep in Central Park's northern stretch, Springbanks is perhaps the park's most secluded arch. It is accessed by descending a flight of steps, like Trefoil Arch. It is quite wet after a heavy rain as water cascades into it to join Montayne's Rivulet. Springbanks is said to resemble some of the archways in London's Regent's Park. Location: takes park path under park drive between the North Meadow and The Loch at about 102nd Street. Built: 1863 by Vaux and Jacob Wrey Mould. Made of Hudson River Valley sandstone. Unlike other cast iron bridges in Central Park, SE Reservoir Bridge is distinguished by a flat platform instead of an arched one. Like its sister, SW Reservoir Bridge, this bridge has also been reconstructed. In 1989 its concrete deck was replaced with a tongue and groove wood deck, and it got new railings to approximate the original ones from 1865. Location: Park path over bridle path just west of 5th Avenue near The Reservoir at approximately 86th Street. Built: 1865 by Vaux and the Cornell Ironworks. Made of cast iron and steel. Greywacke Arch is the only arch in Central Park that is named for the material with which it is built. "Greywacke" is a variety of sandstone obtained from the Hudson River Valley. Constructed of New Brunswick sandstone, Glade Arch is another of Calvert Vaux' older central Park bridges. It suffered rather more deterioration over the years from tree roots, crumbling and graffitists. Finally, after a large part of the balustrades (fence posts) were wiped out by a snow plow in 1980, a complete renovation was completed the next year. The "western" side of Trefoil closest to the Lake has a round archway instead of a trefoil, and plain voussoirs (blocks that make up the arch) instead of the floral patterns found in the "eastern" trefoiled side. Scenes from the Jack Lemmon classic "The Out Of Towners," one of the most anti-New York movies ever made, were filmed at Trefoil. In architectural lingo, "trefoil" means a design featuring 3 lobes, like a shamrock. Consequently, 'quatrefoil' and 'cinquefoil' mean designs featuring 4 and 5 lobes. Inscope Arch is actually one of the "newer" arches in Central Park. It was built a good ten years after most of the other ones. The present Gapstow replaced the original wood and cast iron structure built by Vaux in 1874. Some of the blocks on the arch, including the keystone, are vermiculated--they have designs cut in them resembling worm tracks. Located next to the arch is a statue of Balto, the lead sled dog who transported diphtheria serum across Alaska in the winter of 1925. Playmates Arch, along with the Dairy, the Carousel, the Zoo and the Chess & Checkers House, is in a part of Central Park once formally designated as the Children's District. Its distinctive yellow and red bricks and beige voussoir blocks gave it the nickname "tri-colored arch." Dipway's granite has a distinctive two-tone bluish color that's offset by its red brick underpass. Its original cast-iron railings are intact. Like many Central Park arches, the underpass gets waterlogged after a rain. Location: takes Center Drive over park path leading to Artisan's Gate at 7th Avenue. Built: 1862 by Vaux and Mould. Made of granite (from a quarry in Seal Harbor, Maine) and red brick.